A tiny nativity, carved from tagua nuts. 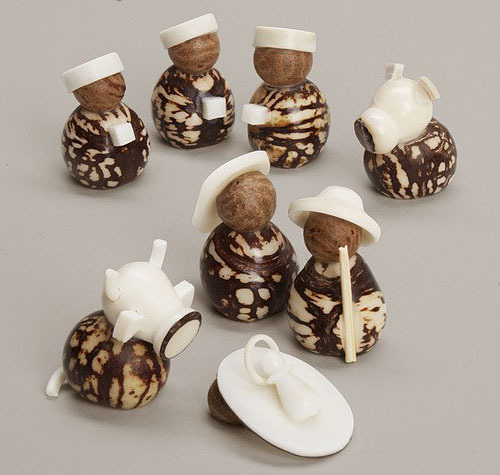 Each figure is produced from an individual nut, with carved tagua pieces adding details. Also known as “vegetable ivory” tagua is produced by a palm-like tree in South America. The nuts fall to the ground when mature, thus harvesting does not damage the trees. Tagua nut’s grain is close and very hard, resembling the finest ivory. Cultural tradition and forest preservation combine in the use of this renewable resource.